We all know that a great costume is only as good as its accessories. Knowing that, is your costume truly great yet? If not, that's ok, we've got you covered. A nice pair of boots can go a long way for taking your costume to the next level. These boots were made for walking and that's just what they'll do when your daughter wear these Girls Red Gogo Boots. These snazzy red boots can be worn with a Wonder Woman outfit and with any little girls gogo or hippie costume. Step right up and buy these cute boots! 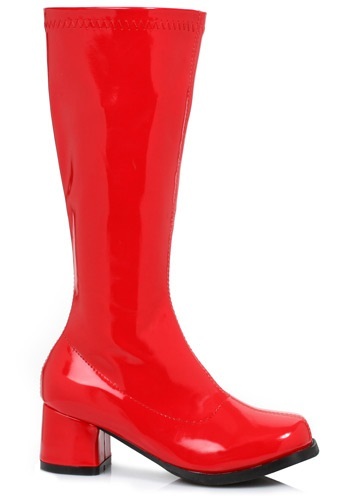 These girl's red boots are perfect for completing just about any look you can think of. They are made of patent leather and have a shine to them that will make your little one truly sparkle this Halloween. The boots zip up the side for an easy fit and they have a modest 1 1/2" heel so that they can walk around in them all night long!